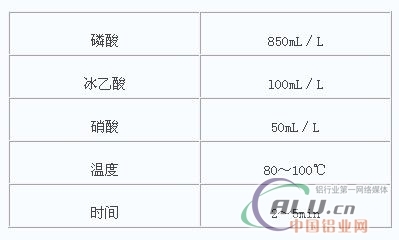 [China Aluminum Network] Chemical polishing of aluminum and aluminum alloys is based on a 70% (mass percentage) phosphoric acid based solution. Commonly used is a mixture of phosphoric acid, nitric acid, and sulfuric acid. When the alloy composition changes, the sulfuric acid content (mass percentage) is 9%. Between 15%, the nitric acid content (mass percentage) varies from 3% to 9%. As the operating temperature is around 105Â°C, a large amount of nitrogen oxides pollutes the environment. Therefore, on the basis of a mixture of phosphoric acid and sulfuric acid, the use of S-type copper brighteners as additives has resulted in a yellow-nosed chemical polishing process. However, such yellow-nosed chemical polishing is only applicable to pure aluminum or aluminum-magnesium alloys, and has a poor effect on other aluminum alloys. Later, there were formulas that only added 2% nitric acid, and similar additives were used, and no extended application range was obtained. However, since the phosphoric acid, nitric acid, and sulfuric acid mixture is adaptable, it is still the mainstream formulation. Aluminum alloys containing higher amounts of copper and zinc are more likely to be chemically polished with 2-5 g/L of chromic anhydride. The manual states that aluminum alloys containing silicon are high, and a mixture of 60 to 65 mL/L nitric acid, 15 to 20 mL/L hydrofluoric acid, and 1 to 2 mL/L of glycerin is used for chemical polishing and dipped at room temperature for 2 seconds. However, this method is more like etching. Bar spoon and stirrer are an enssential tools in the bar or even normal life for wine. Bar spoon have different size and design as custom own need such as some with twist rod. About the stirrer, we have plastic and stainless steel model and all kinds of different design. Of course, we can make custom design also and print with customer logo for promotion.